This is a cool group, check them out when ever you can. 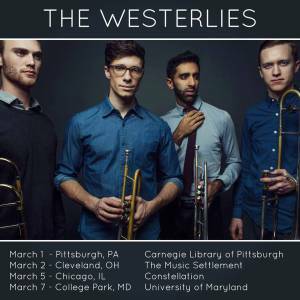 I’m on the first day of a week long tour with The Westerlies! Woke up this morning in snowy Pittsburgh, where we’re playing at the Carnegie Library this afternoon. We’ve gotten somenice press leading up to these shows, check out our full schedule below.